Labor issues are still prominent in global supply chains, but before global businesses can root out modern slavery, forced labor, and human trafficking, they need to know what they look like. 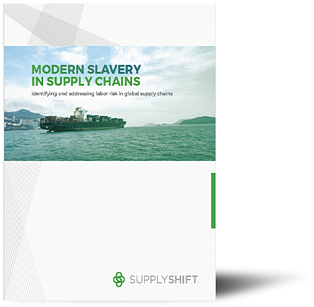 As supply chains become more complex and interconnected, identifying modern slavery before it negatively impacts your brand can be a challenge. Companies are working hard to address these issues, but current approaches and processes make it difficult to get the levels of visibility needed to create a truly holistic view of supplier labor practices. With the right tools and the right approach, a strategic view of supply chain labor risk is within reach for any organization.